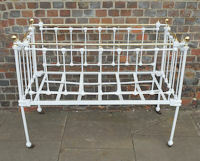 Original, quality, late 19th century, child's cot which will dismantle into five panels. This superb example has a wrought iron frame with cast iron mounts, brass top rails and decorative brass mounts, knobs and top collars. 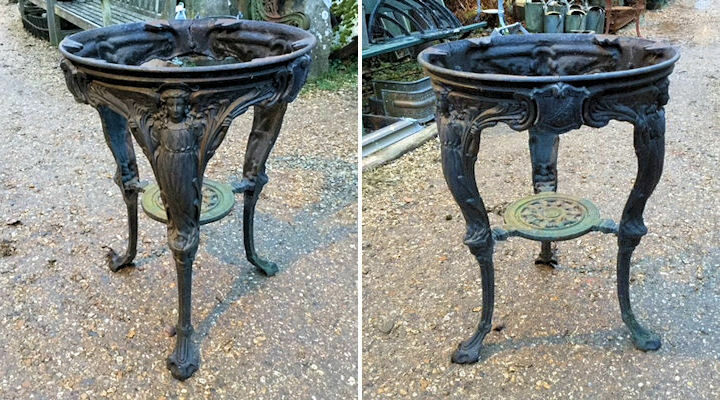 The ironwork has been professionally sand blasted and stove enamelled white and the brass has been polished and lacquered, although the lacquer may be removed at no extra cost. One brass rail is a replacement cut to suit. The original castors, in cast iron with ceramic wheels, have been retained and all is complete and in good order. For safety's sake it would be advisable for an inner bumper protection to be fitted if it is required to be used as a cot. 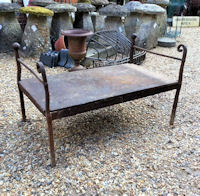 This would also make a super feature as a jardiniere in the hall or landing, a small sofa with one side panel removed or a small single bed with both the side panels taken out, so many uses. Some minor chips to the paintwork, some minor dents to the brass, otherwise all is complete and in good and working order. Set up 48" x 24" + 37.5" tall including knobs and will take mattress size 45.5" x 22.5". Original, quality 1920's / 30's beech and elm high laboratory stool with a short back with a curved rail, square form legs and stretchers all in pale beech and a good shaped seat in elm. All in the original pale finish. 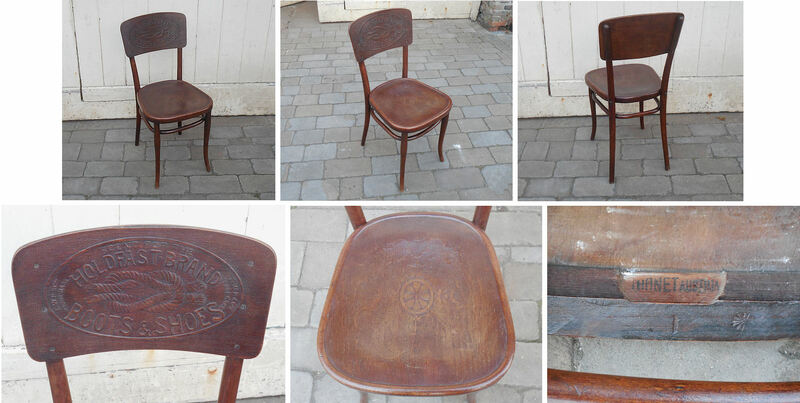 The reverse of the chair back has an original enamelled number "68" with some chips. 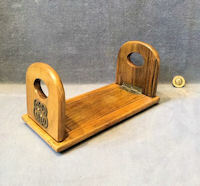 A good sturdy usable stool. Complete and in good order. 36" tall at back + 16" widest at top. 23.5" tall at top of seat board. 14" front to back at seat. 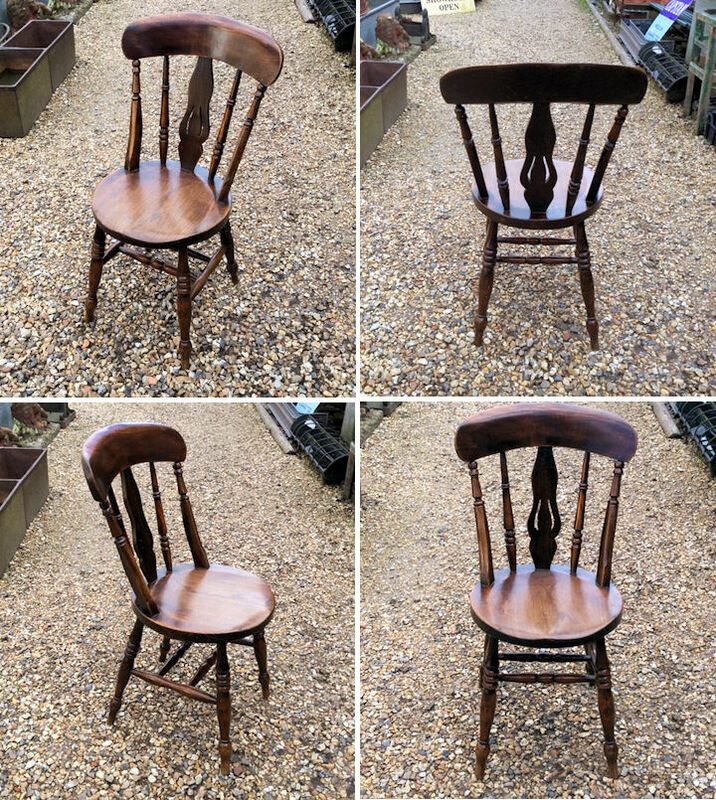 Original, quality late 19th century beech and elm kitchen chair of an unusual form. The circular seat, legs, top rail and two spindles in the back are elm and the rest is beech all in the original colour and finish. A good firm chair. Complete and in good order. 34.5" tall at back + 18" to top of seat board. 18.5" top rail and total 20" front to back. 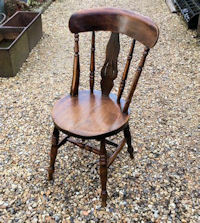 Original, quality late 19th century beech and elm Smoker's Bow chair. This good example has the seat, top rail and arms in elm and the legs, stretchers and spindles in beech, all with a good grain and colour. 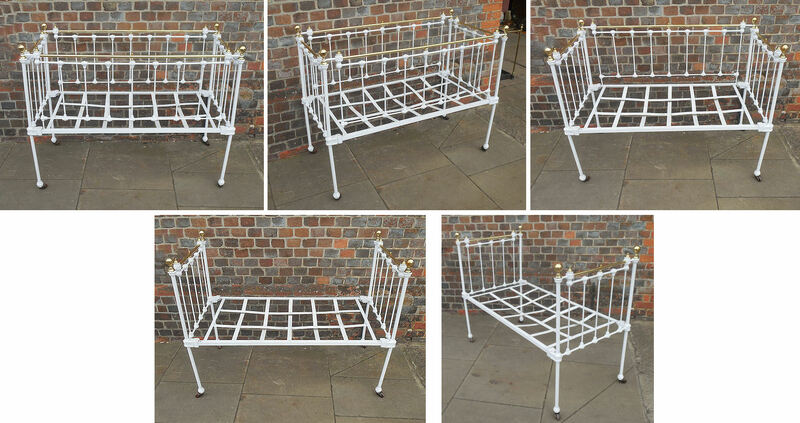 The legs are well shaped and chunky with double stretchers and the top rail and arms have good style and shape. A good firm and sturdy chair. Complete and in good and working order. 30" tall at back and 18" to top of seat board. Arms 24.5" wide, front legs 21" widest and total 24" front to back. 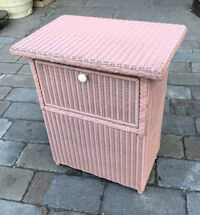 Original, quality 1940's Lloyd Loom Linen basket in the original pink colour. 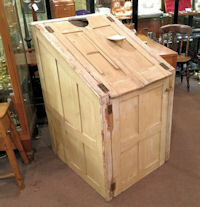 This unusual model with a drop flap to the front is the first we have seen. A very clean example in super condition and complete and with an ivorine label to the back of the flap detailing "Lloyd Loom Lusty Product". 22" tall and 18" x 12" front to back. Body 15.5" x 10". 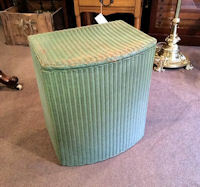 Original, quality beech and elm stool manufactured in 1912. This sturdy example has a rectangular shaped thick elm top with a cut out handhold, all on four chunky legs turned in beech. The legs show through the seat and are fixed with wedges. 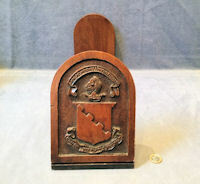 This stool is typical of the High Wycombe area of England and is stamped accordingly to the underside of the seat for the makers "B.North & Son West Wycombe" and date coded for 1912". Complete and in good and working order. 18.5" tall, top 15.5" x 10.25" x 1.5". Spread of legs on floor 16.5" x 15.5". 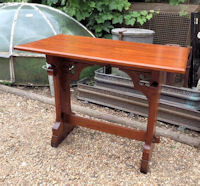 Original, quality late 19th century pitch pine side table in a 'Gothic Revival" style. 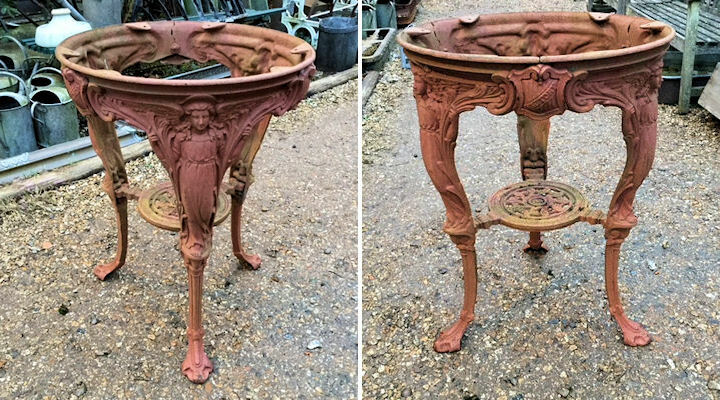 This super table has an ecclesiastical feel with the pegged side supports and stretchers and carved decoration to the base. A good and sturdy table in a waxed finish. Complete and in good and working order. 30.5" tall x 39.5" x 20.5". 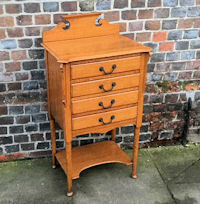 Original, quality 1920's honey coloured oak cabinet with four drawers for sheet music on four turned legs with an under tier shelf, corner mounts, a decorative top pediment and the original steel drop handles. 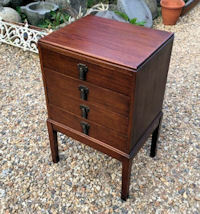 The drawers have drop down fronts but these have been fixed up for use as normal drawers, but with the removal of one screw from each side of each drawer the fronts will swing down for use with sheet music. 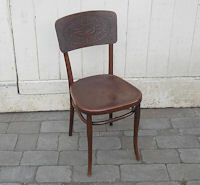 All in the original finish and in superb condition. Complete and in good and working order. 40" tall including pediment, 21.75" widest and 15.5" front to back max. 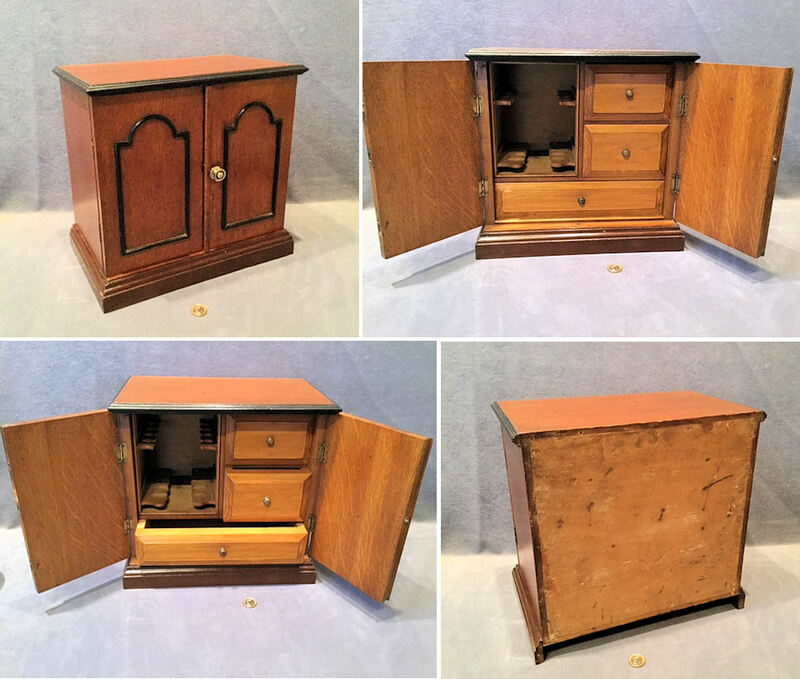 Original, quality 1930's four drawer mahogany cabinet for sheet music. 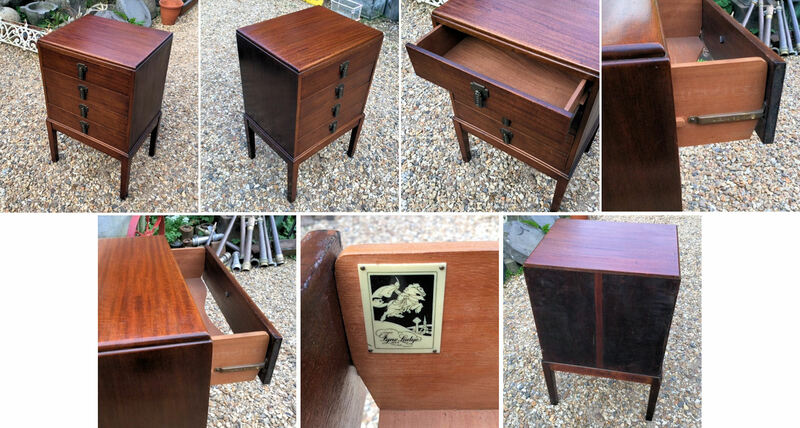 This super example has patent drawers with fall down fronts, typical for a sheet music cabinet. 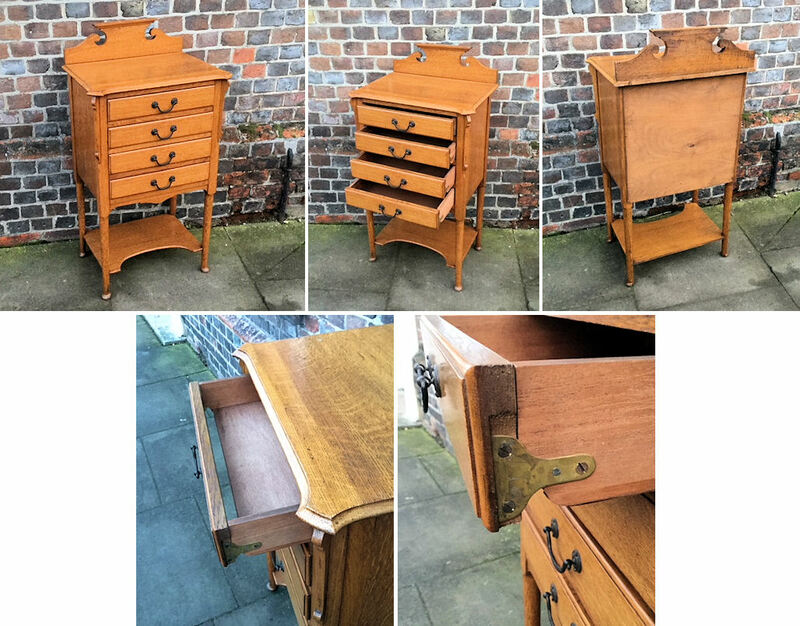 We have fixed these drawer fronts with an extra screw and they now operate easily and more usefully as near normal pull out drawers and offer the added benefit as a filing cabinet or a bedside cabinet. 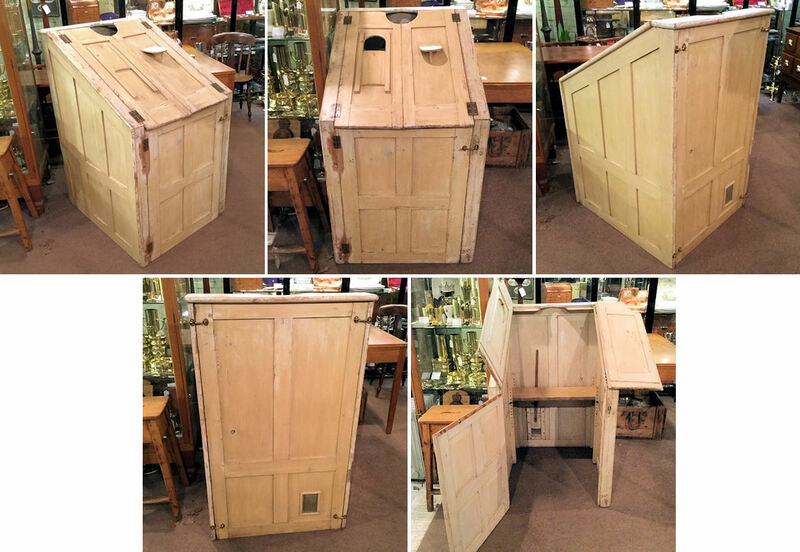 The whole has the appearance of a chest on a stand, although it is all in one. 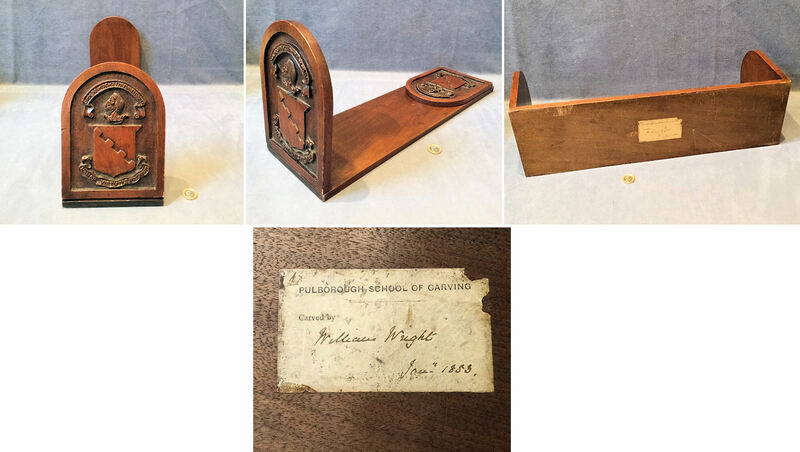 It has retained the original pressed tin drop handles with the registration number for the year 1931, the maker's ivorine label for " Fyne Ladye Regd" and the drop down drawer fronts mechanism impressed "Stones Patent". The mahogany has been cleaned and waxed and now all is complete and in good and working order. 30.5" tall x 19.5" x 15.25" front to back. Each drawer interior 15.5" wide, 13" front to back and 3.25" deep. 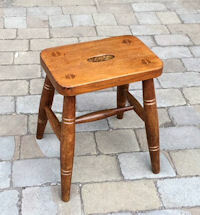 Original, quality mid 19th century pine four legged stool with an old replacement oval shaped oak top. This example has splayed and tapered square legs with a deep frieze above, all the joints are pegged and the base has much of the original brown paint. Well worm treated and fitted with an oval oak top from another stool of similar age. Complete and in good and working order. 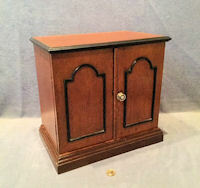 23.5" tall and oval top 12.5" x 9.5" x 1". Spread of legs at floor 16" x 13". 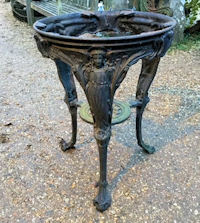 Original, quality, circa 1900, circular cast iron pub table base with three legs and an undershelf. Each leg has a central figure of an angel and the three joining plates to the top section are embossed with 'Victory' within a shield form. 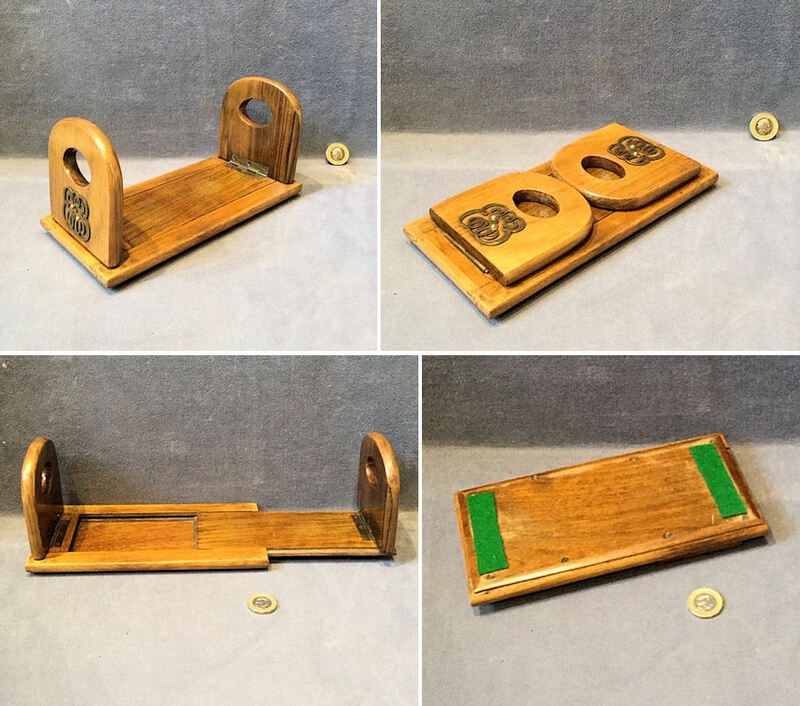 These tables were manufactured to commemorate the end of the Boer War in 1902. 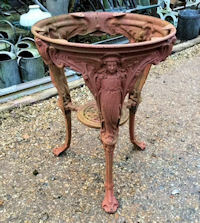 This example is in the old red oxide paintwork awaiting a top and finishing. Complete and in good and working order. 29.5" tall, top diam 22" and 24" spread of feet. 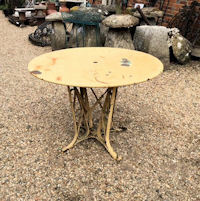 Original, quality, circa 1900, circular cast iron pub table base with three legs and an undershelf. Each leg has a central figure of an angel and the three joining plates to the top section are embossed with 'Victory' within a shield form. These tables were manufactured to commemorate the end of the Boer War in 1902. This example is in old black paint awaiting a top to finish. Complete and in good and working order. 29.5" tall, top diam 22" and 24" spread of feet. 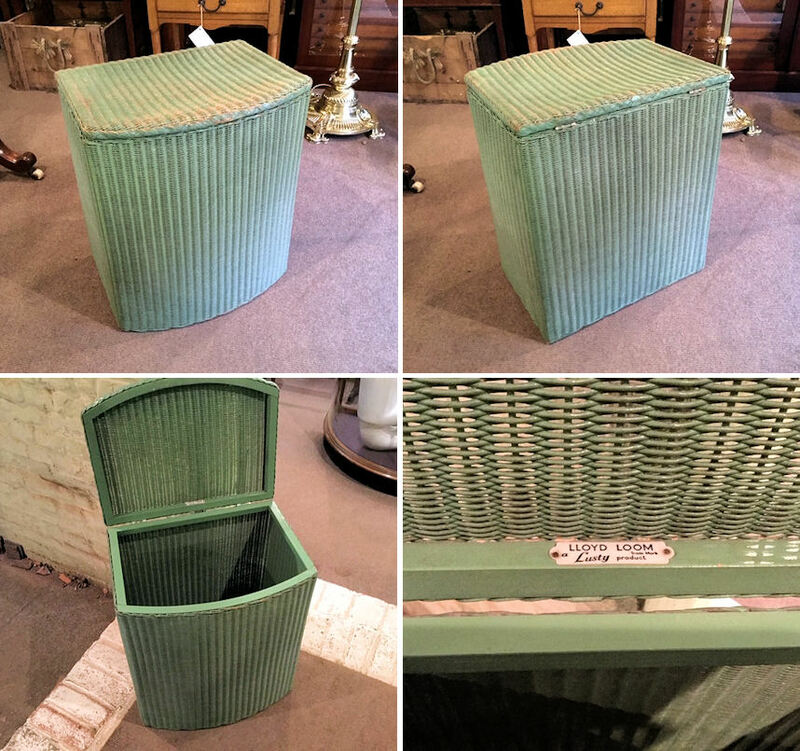 Original, quality 1930's / 40's Lloyd Loom rectangular shaped Linen basket in the original green with gold edge finish. 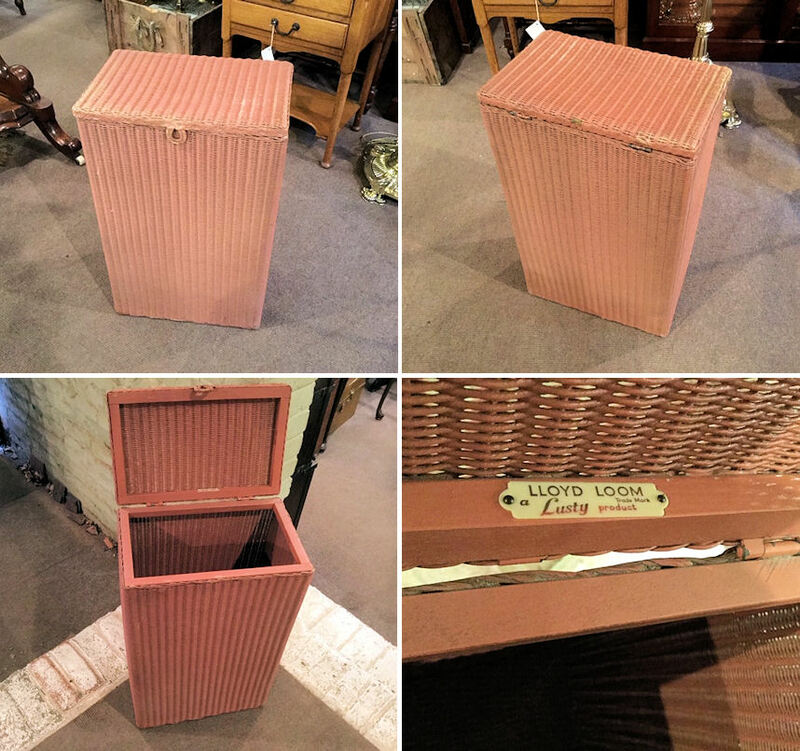 This example has an ivorine label to the lid detailing "Lloyd Loom, a Lusty product" and "trademark". Complete and in good and working order. 25.5" tall x 15.5" x 10" front to back. 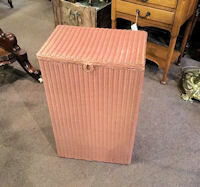 Original, quality 1930's / 40's Lloyd Loom rectangular shaped linen basket in the original pink finish. This example has an ivorine label to the lid detailing "Lloyd Loom, a Lusty product" and "trademark". Complete and in good and working order. 25.5" x 15.5" x 10" front to back. 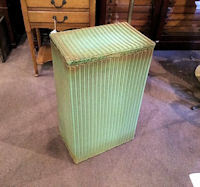 Original, quality 1930's / 40's Lloyd Loom 'D' shaped linen basket in the original green finish. 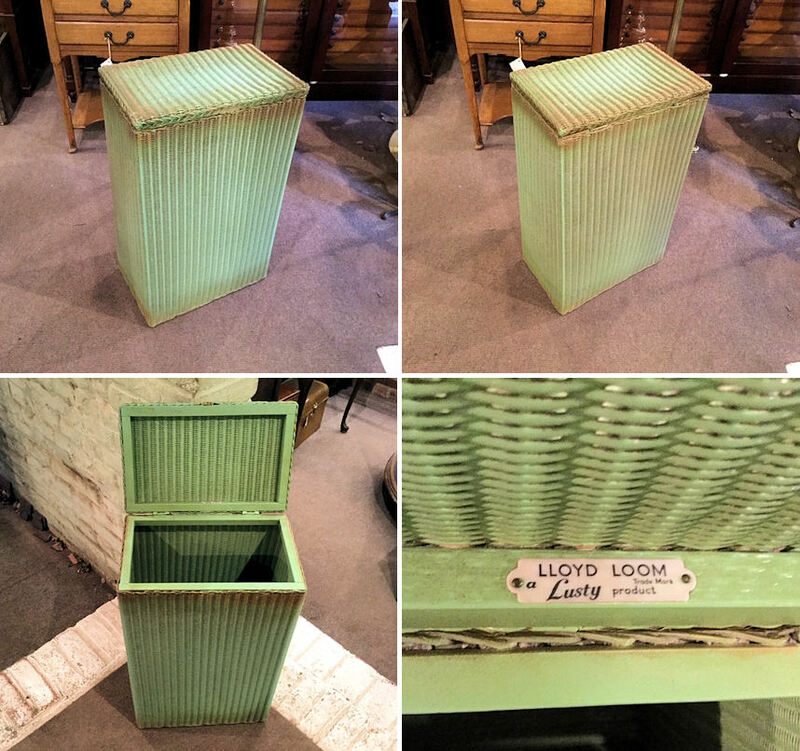 This example has an ivorine label to the lid detailing "Lloyd Loom, a Lusty product" and "trademark". The top is a little stretched from being sat upon (not advisable), but otherwise complete and in good and working order. 21" tall x 18" x 13.5" front to back.